The weather for the last four weeks is impacting on grass growth where adequate covers per hectare are creating a management challenge. Farmers are trying to maintain rotations of 16 to 19 depending on the soil type, moisture and the dry matter intake for the production. To maintain this buffer, feeding has started with 4Kg DM to 7Kg DM preferably fed before evening milking indoors as the cows will have shade and will consume more. 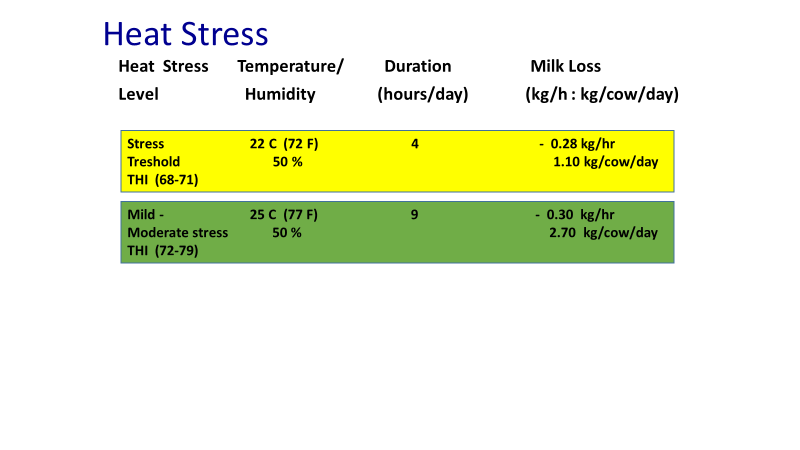 Water availability is critical in keeping the cow cool and maintaining dry matter intake. This can be assessed by measuring rectal temperature. Normal rectal temperature is 38ᵒC to 39.3ᵒC, it is estimated that a 0.53 litre drop results from every 0.6ᵒC increase in rectal temperature. The table below shows further the effect. In these conditions the soil moisture containing the minerals will be below the root depth therefore reducing the uptake of the macros calcium, phosphorous and magnesium along with the trace elements. The phosphorous has dropped in these conditions from 0.4% to 0.25% in the dry matter of the grazing sward. As cows are dependent on a daily intake of phosphorous and magnesium to meet their requirements additional supplementation will be required, approximately 100 grams of a quality post calving mineral. This can be top dressed on the buffer forage. Buffer feeding is critical to maximise production and maintain fertility of the dairy herd.